Today’s task was this area and too my surprise , a lot of things took shape , as I procrastinated about what to with the tangle of honeysuckle my gaze fell onto some paint that was left over from last year and yes I painted the area behind the honeysuckle , nice I thought then I tidied up the bed here and found under one of the trees more tangles of something that must have thrived at some time as there was just as much old growth here as on the honeysuckle so I asked my lovely husband would he do the honours of digging it out as I held the branches back , then I transplanted it in a more open space afraid again to start cutting at it , I will just leave it feed it and water it and see how it goes. I found a trellis of sorts that I had used one year for some sweet peas which I remember gave great colour in the garden so I put this here to the side of the honeysuckle , do you see the fairy? I put her there to cast some magic on the honeysuckle and maybe when I find a picture of what the honeysuckle looks like pruned in February I may get the courage to snip at it , rather pleased with my work today , have a lovely blister between my thumb and finger as proof of my efforts today ha ha. Pas de probleme as the French would say as my challenge tomorrow is to tackle the roses and as I have never pruned a rose before this will be another challenge for me, I will post the pics of the roses after this post in case any of my lovely readers would like to share their knowledge with me of how to prune them etc. Another happy day for me and for this I am grateful. Happy days to all my readers and happy gardening too. My question today is any ideas on some ground cover to go in their alongside the honeysuckle that would help keep the weeds down and come back year after year? The last 2 photos are of the plant I found under one of the trees that I transplanted, please feel free to comment , all suggestions welcomed with happiness. You will not need ground cover there, you have a holly, honeysuckle and looks like thuja, Maybe close up the window as you wont be able to see out in a couple of years unless your going to camp out and look in. If you do want something in the short term, vinca is very useful. Thanks Sive , is there a more common name for vinca about how many plants would I need for that area in front of the window would you advise , what spacing do you suggest between the vinca plants, I hope to get these this Thursday if available , do you think the plants would be available now? MY Challenge today consisted of getting some Stone from nearby and shifting it to the area I want to build some no dig beds, manure is the problem , do I use fresh manure or will i have to wait a certain length of time to add it to the layers in the no dig bed. Do the nurserys sell bagged manure that can be used immediately lots of questions but eager to learn here , best regards Kathy. Do NOT use fresh manure. The older the better. The common name for Vinca is Periwinkle, but the garden centres will probably sell it as Vinca. For that area one plant will probably be enough. I have a variegated Vinca major (big) 18'' high by 4' wide and a white-flowered V. minor (small) 6" x 3'. They root along the stem so they could spread indefinitely! As regards to poo never use fresh. Horse poo in straw is about as good as it gets (my opinion). Are there any stables near you? A friend of mine brings me a link box full of donkey poo every year - he is just glad to get shot of it! 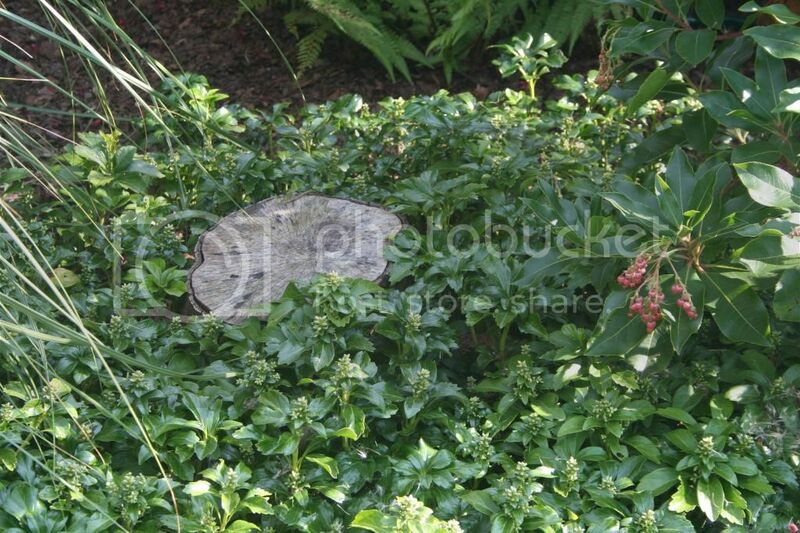 Ok since your not going to listen to me, see above comment, why not try Pachysandra trerminalis or Epimedium. planted 8inches apart. Thanks green and sue and sive , just trying to get used to the site , so please forgive me if I seem to post in the wrong forums etc, I really do appreciate all your replies they are like gold dust to me or water in a desert would describe them better , I really dont have a lot of experience in planting etc so your replies are helping me so much with the challenge and I would like to thank you all very sincerely. Kathy. Pachysandra Terminalis really needs soil bordering on acidic. Although of course, loads of manure will help to increase acidity. Yes, fresh thorns from briars are bad, Dead briars have even worse thorns! feels great to clear them though. My challenge is to save the agapanthus from the deer. They nibble them all as the new shoots come up. Any ideas? cover with a large hanging basket upside down.